If used in a preheat circuit where a starter is required use an FS-4 starter. 880 lumens, 7,500 average life hours, 52 CRI, 3000K. Boxed. Used on Bi-Pin fixtures. Averages 12,000 life hours. Used in ceiling fans and fixtures. 3000K, 12,000 average life hours. Feit Electric Fluorescent Lamp, F13T5/CW Designation, 13 W, 120 V, Tubular Bulb, Miniature Bi-Pin Base, T5 Shape, 7500 hr Average Life, 4100 K Color Temperature, Cool White Lamp, 5/8 in Diameter, 21 in Length, For Troffer Warm white phosphor, T5 bulb, 3000K color temperature, 52 CRI. 7500 average rated life. Averages 12,000 life hours. Designer warm white rare earth phosphor. Color temperature 3000K, 70 CRI, 9,000 average life hours. Warm white phosphor, T5 bulb, 3000K color temperature, 52 CRI. 7500 average rated life. Averages 7,500 life hours. 70 CRI, 3000K color temperature 18" length. Used in ceiling fans and fixtures. 3000K, 12,000 average life hours. Averages 12,000 life hours. 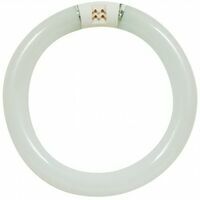 Feit Electric Fluorescent Lamp, FC30 Designation, 30 W, Circular Bulb, 4-Pin Base, 12000 hr Average Life, 3000 K Color Temperature, Warm White Lamp, 9 in Diameter, For Ceiling Fan and Fixtures Averages 10,000 life hours at 2,800 lumens. 7.5" diameter. Has GU10q base. Fluorescent T8 with G13 medium bi-pin base. 4100K. Troffer, track and recessed lighting. Averages 20,000 life hours. 48" overall length x 1.59" diameter. Tungsten bulb, 4100K, 20,000 average life hours. 48" overall length x 1.59" diameter. 120 volts. Fluorescent T12 with G13 medium bi-pin base. 4100K, cool white. Energy efficient. Fluorescent T12 with G13 medium bi-pin base. 4100K, cool white. Energy efficient. Used on Bi-Pin fixtures.12" length. Used on Bi-Pin fixtures. Used on Bi-Pin fixtures. Averages 12,000 life hours. 96" overall length x 1.59" diameter. 87 CRI, 4100K, 3872 mean lumens at 35C. Used on Bi-Pin fixtures. Designer warm white rare earth phosphor. Color temperature 3000K, 70 CRI, 9,000 average life hours. Rare earth phosphor, 9,000 average life hours. 4100K color temperature, 70 CRI. Actual length 14.780 inches. Nominal length 15". 1.59 diameter. 648 mean lumens. Averages 18,000 life hours. 36" length overall. Used on Bi-Pin fixtures. Used on Bi-Pin fixtures. Used on Bi-Pin fixtures.